London – Wednesday, 1st April 2015 – Scott Allan and Sandy Robb are set to co-headline the latest offering from famed promoter Stewart Allan, which takes place at the Rivals Gym in Newmains, Scotland on Saturday 25th April. The stellar line-up features a number of exciting young prospects, however the match-up that has been attracting the most attention is the co-headlining Cruiserweight battle between Sandy Robb (9(5)-2) and Blackpool’s Mathew ‘The Rock’ Ellis (20(9)-10-2). Robb, who has been competing in Canada since 2012, will be competing in his first bout on Scottish soil since his excellent fourth round stoppage victory over Poland’s Marcin Radola in May ’06. Robb’s opponent, former WBC International title challenger Mathew Ellis, has battled it out with some of the very best in the domestic game, such notables as Tyson Fury, Enzo Maccarinelli, Tony Bellew, Matty Askin etc, so no surprise why this is particular bout has captured everyone’s attention. The co-headliner with Robb-Ellis sees local Bantamweight prospect Scott Allan (4-1), who is bursting with confidence following his superb victory over previously unbeaten Omran Akbari back in December, face his toughest test to date, when he goes toe-to-toe with former Commonwealth title challenger Ghana’s Isaac Quaye (27(18)-9-1). The support card for the outstanding co-headline bouts, features a mix of the experienced and brand new faces to the pro game. Glasgow’s Ronnie Nailen makes his most welcome return to the fray, in a four round Welterweight contest, against Nottingham’s hugely experienced Matt Scriven. Nailen, whose record stands at three wins and a single loss, will be looking to secure a good win on April 25th, to kick start part two of his career. Glasgow based Iranian Mohammad Babazadeh (2(1)-0) will be looking to extend his winning start to his career, following an excellent points victory over Mitch Mitchell on his debut in November and more recently the excellent third round stoppage win over Bulgaria’s Borislav Zankov in March. On April 25th Babazadeh will face Belfast bruiser Phil Townley, whose most recent outing see him unsuccessfully challenge Ireland’s Tommy Tolan for the Irish International title. Scott Allan’s younger sibling, Sam, is set to make his professional boxing debut and in doing so gets handed a tough test in Dundalk, Ireland’s former Irish tile Challenger Michael Kelly (8(2)-6-1). Also making his pro debut will be Ryan Lyall, who also has a tough test lined-up, as he goes against Middlesbrough’s Chris Wood, who scored a first round stoppage win over Latvia’s Edgars Milevics on his recent pro debut. 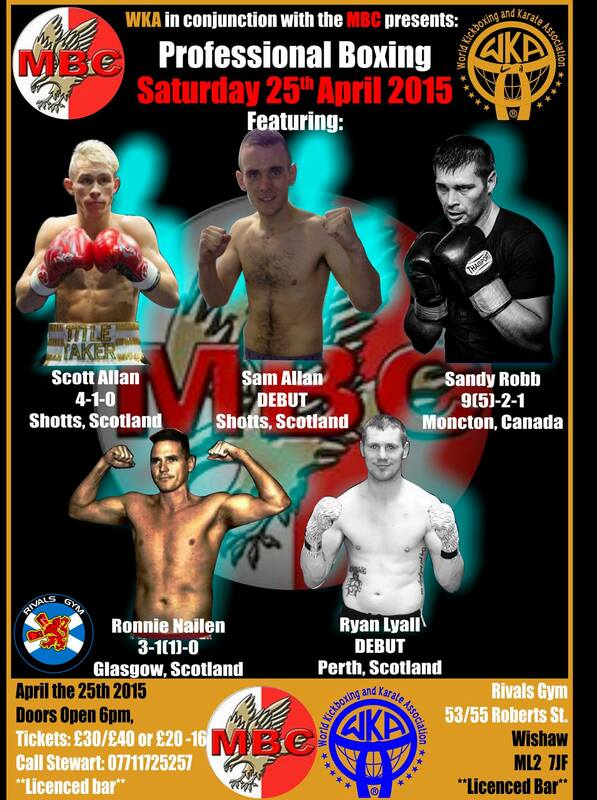 Sandy Robb versus Mathew Ellis and Scott Allan versus Isaac Quaye co-headline the Stewart Allan (Rivals Promotions) event at the Rivals Gym in Newmains, Scotland on Saturday 25th April 2015. Tickets priced £30 and £40 are available direct from any of the boxers taking part, or call Stewart on 07711 725257.